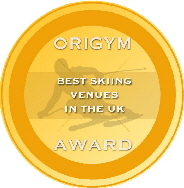 We have been selected as one of the best dry slopes in the country - click for more. We are a Go Ski Go Board delivery location (Ski only). Gifts for anyone, including you, if you’ve been given some money! How about something of lasting value that teaches new skills and provides a great opportunity to enjoy the outdoors? or even a year’s Membership are available at the slope. How to watch skiing and snowboarding on TV Thanks to the folk at Basecampgroup, here’s a pointer to their guide. Going skiing in France? How about learning, or improving spoken French so that you can communicate better when you get there? Friendly conversation classes are coming to Hanley, Leek and Ashbourne. For general info click for leaflet. Click again for the web site. Parties. We don’t do ski parties any more but give this a try. For toddlers to 10 year olds Morgan’s Mayhem is a party on a farm. click for details. North Staffs Ski Club is committed to ensuring all Children participating in snow-sports have a safe and positive experience. Your chance to win up to £25,000 and support the ski club. Good Luck. Click for more info.